The evolution of The Big Bang Theory’s Sheldon has acclimatised modern audiences to notion of tittering at the eccentricities of people on the autistic spectrum. Generalities blind audiences to the fact that people on that spectrum are very much distinct individuals with likes, dislikes and talents, just as with the rest of us. 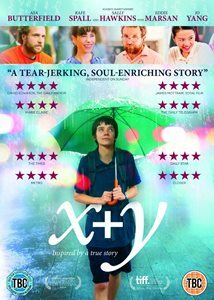 Morgan Matthews’ X+Y (2014) cannot be accused of ridiculing its subject, Nathan, who is considerately portrayed by Asa Butterfield. He is a maths whizz but not merely a cold, obsessed machine. Nathan is diagnosed at a young age and his father (Martin McCann), being a relaxed soul, finds it easier than his mum (Sally Hawkins) to cajole and coax a smile out of his seemingly distant son. Tragedy strikes and Nathan’s mother Julie (Sally Hawkins) has to try and find her own way to relate to him, the most obvious thing she can do is finding her maths-mad son some advanced tuition. Teacher Mr Humphreys (Rafe Spall), who in the grand, great tradition of cranky alcoholic teachers is brilliant but scarred, becomes a solid fixture in the lives of Nathan and Julie and years pass. Humphreys enters Nathan in a fancy maths tournament which will require much plane travel and spending time with competitive strangers, a situation which provides a harsh challenge for mother, son and teacher. The cinematography is awash with bright colours, mirroring those which would pop out at someone with Nathan’s diagnosis, that detail being extended to the eye colour of the actor. The attention to detail in the look and sound of the film is just beautiful. The score elevates what is a story of mundane emotion, common in that it is one that the majority of the human race feel in wanting to connect with others. Butterfield, aided by James Graham’s screenplay, displays Nathan’s many facets: worry about being different; nervousness in new situations, even in competitions which we are led to believe that he should easily adapt to; clingy protectiveness to his mother. The actors all handle themselves very competently. Where Butterfield is hesitant, Spall seems to be paying homage to Michael Caine in Educating Rita with his sweary, bad tempered teacher and Hawkins is extremely nervous but also warm. Eddie Marsan is at his repulsive best as the sneering Richard, his ability to access the essence of such opposing characters is a wonder as usual. Overall, X+Y is a truthful and humane story. Nathan is not just a diagnosis or a maths whizz, he is a complex person with emotions and sometimes those emotions manage to get the better of him. It might have been nice for Hawkins’ character to be fleshed out a bit more, but as it stands this is a pleasant and forgiving examination of human weakness.